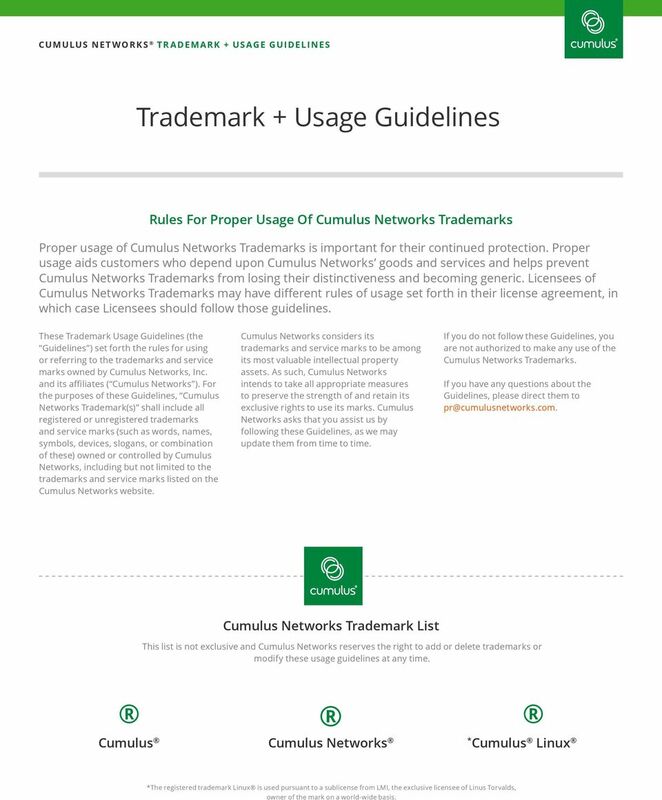 Download "Trademark + Usage Guidelines"
1 Trademark + Usage Guidelines Rules For Proper Usage Of Cumulus Networks Trademarks Proper usage of Cumulus Networks Trademarks is important for their continued protection. Proper usage aids customers who depend upon Cumulus Networks goods and services and helps prevent Cumulus Networks Trademarks from losing their distinctiveness and becoming generic. Licensees of Cumulus Networks Trademarks may have different rules of usage set forth in their license agreement, in which case Licensees should follow those guidelines. 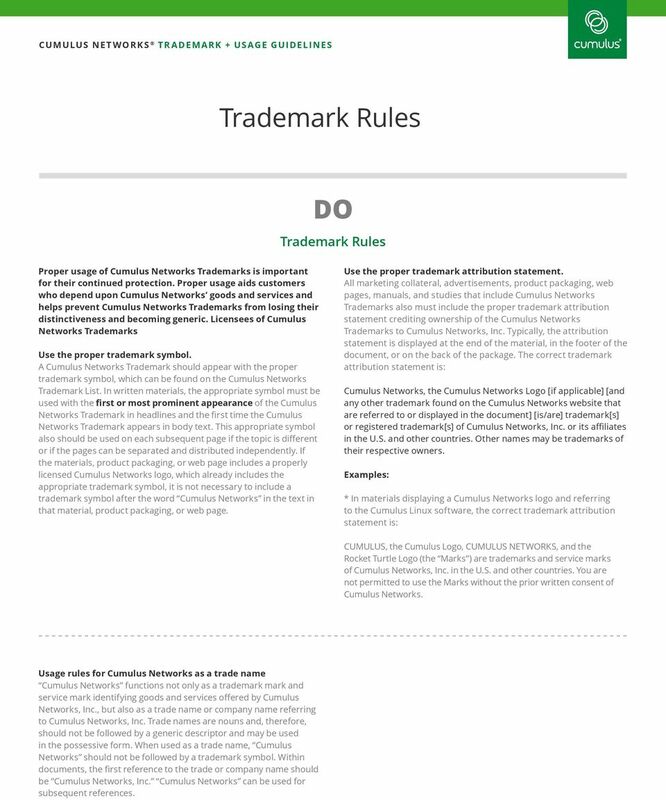 These Trademark Usage Guidelines (the Guidelines ) set forth the rules for using or referring to the trademarks and service marks owned by Cumulus Networks, Inc. and its affiliates ( Cumulus Networks ). For the purposes of these Guidelines, Cumulus Networks Trademark(s) shall include all registered or unregistered trademarks and service marks (such as words, names, symbols, devices, slogans, or combination of these) owned or controlled by Cumulus Networks, including but not limited to the trademarks and service marks listed on the Cumulus Networks website. Cumulus Networks considers its trademarks and service marks to be among its most valuable intellectual property assets. As such, Cumulus Networks intends to take all appropriate measures to preserve the strength of and retain its exclusive rights to use its marks. Cumulus Networks asks that you assist us by following these Guidelines, as we may update them from time to time. 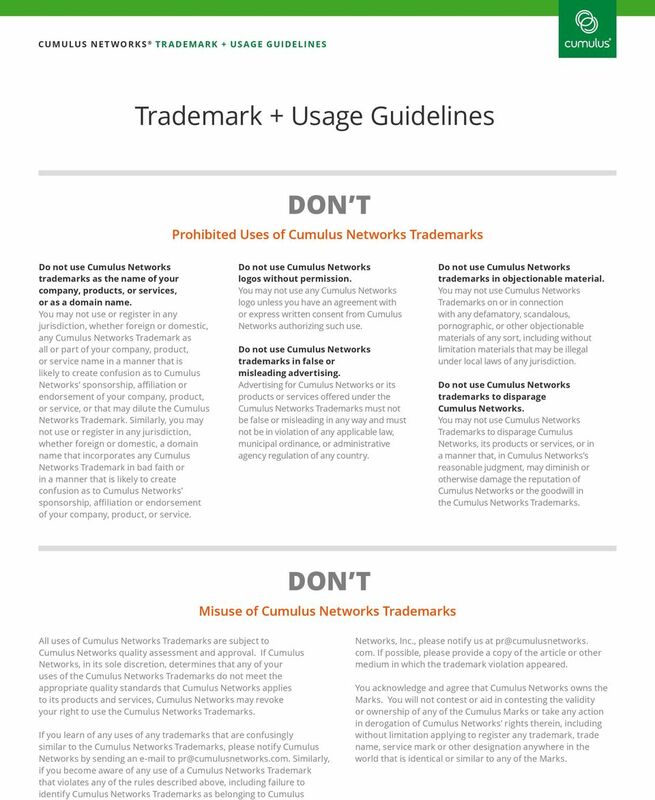 If you do not follow these Guidelines, you are not authorized to make any use of the Cumulus Networks Trademarks. 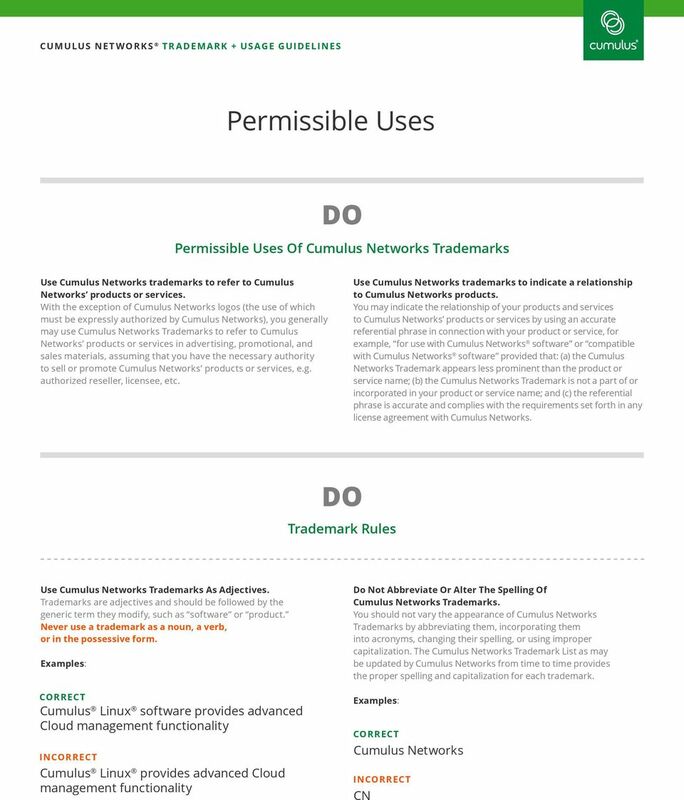 If you have any questions about the Guidelines, please direct them to Cumulus Networks Trademark List This list is not exclusive and Cumulus Networks reserves the right to add or delete trademarks or modify these usage guidelines at any time. Cumulus Cumulus Networks * Cumulus Linux *The registered trademark Linux is used pursuant to a sublicense from LMI, the exclusive licensee of Linus Torvalds, owner of the mark on a world-wide basis. 3 Proper usage of Cumulus Networks Trademarks is important for their continued protection. Proper usage aids customers who depend upon Cumulus Networks goods and services and helps prevent Cumulus Networks Trademarks from losing their distinctiveness and becoming generic. Licensees of Cumulus Networks Trademarks Use the proper trademark symbol. A Cumulus Networks Trademark should appear with the proper trademark symbol, which can be found on the Cumulus Networks Trademark List. In written materials, the appropriate symbol must be used with the first or most prominent appearance of the Cumulus Networks Trademark in headlines and the first time the Cumulus Networks Trademark appears in body text. This appropriate symbol also should be used on each subsequent page if the topic is different or if the pages can be separated and distributed independently. If the materials, product packaging, or web page includes a properly licensed Cumulus Networks logo, which already includes the appropriate trademark symbol, it is not necessary to include a trademark symbol after the word Cumulus Networks in the text in that material, product packaging, or web page. Use the proper trademark attribution statement. All marketing collateral, advertisements, product packaging, web pages, manuals, and studies that include Cumulus Networks Trademarks also must include the proper trademark attribution statement crediting ownership of the Cumulus Networks Trademarks to Cumulus Networks, Inc. Typically, the attribution statement is displayed at the end of the material, in the footer of the document, or on the back of the package. The correct trademark attribution statement is: Cumulus Networks, the Cumulus Networks Logo [if applicable] [and any other trademark found on the Cumulus Networks website that are referred to or displayed in the document] [is/are] trademark[s] or registered trademark[s] of Cumulus Networks, Inc. or its affiliates in the U.S. and other countries. Other names may be trademarks of their respective owners. * In materials displaying a Cumulus Networks logo and referring to the Cumulus Linux software, the correct trademark attribution statement is: CUMULUS, the Cumulus Logo, CUMULUS NETWORKS, and the Rocket Turtle Logo (the Marks ) are trademarks and service marks of Cumulus Networks, Inc. in the U.S. and other countries. You are not permitted to use the Marks without the prior written consent of Cumulus Networks. Usage rules for Cumulus Networks as a trade name Cumulus Networks functions not only as a trademark mark and service mark identifying goods and services offered by Cumulus Networks, Inc., but also as a trade name or company name referring to Cumulus Networks, Inc. Trade names are nouns and, therefore, should not be followed by a generic descriptor and may be used in the possessive form. When used as a trade name, Cumulus Networks should not be followed by a trademark symbol. Within documents, the first reference to the trade or company name should be Cumulus Networks, Inc. Cumulus Networks can be used for subsequent references. 4 Usage Rules for Cumulus Networks Logos Logo Usage Rules You may not use any Cumulus Networks logo unless you have an agreement with or express written consent from Cumulus Networks authorizing such use. 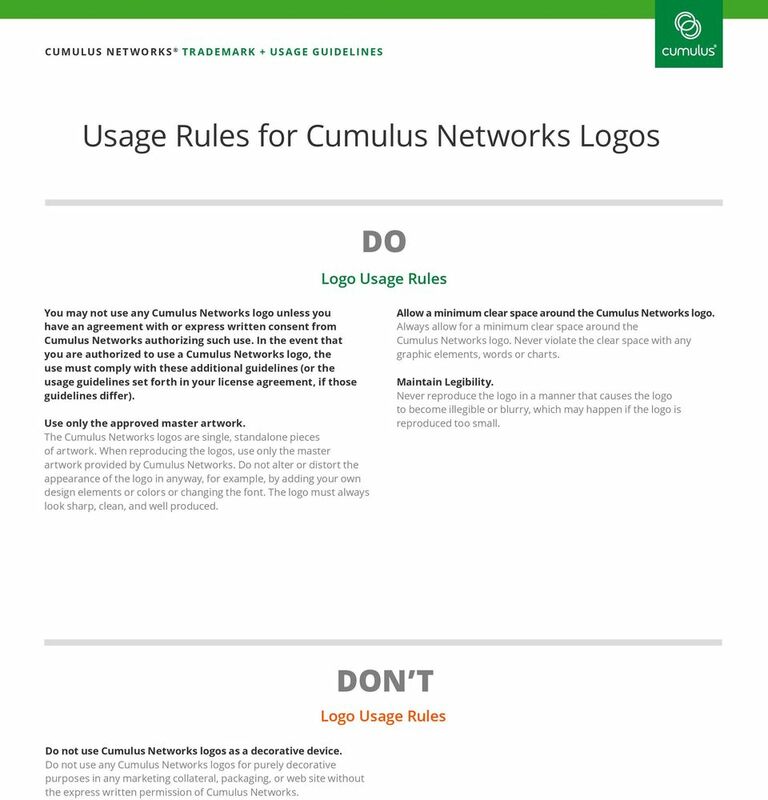 In the event that you are authorized to use a Cumulus Networks logo, the use must comply with these additional guidelines (or the usage guidelines set forth in your license agreement, if those guidelines differ). Use only the approved master artwork. The Cumulus Networks logos are single, standalone pieces of artwork. When reproducing the logos, use only the master artwork provided by Cumulus Networks. Do not alter or distort the appearance of the logo in anyway, for example, by adding your own design elements or colors or changing the font. The logo must always look sharp, clean, and well produced. Allow a minimum clear space around the Cumulus Networks logo. Always allow for a minimum clear space around the Cumulus Networks logo. Never violate the clear space with any graphic elements, words or charts. Maintain Legibility. Never reproduce the logo in a manner that causes the logo to become illegible or blurry, which may happen if the logo is reproduced too small. N T Logo Usage Rules logos as a decorative device. Do not use any Cumulus Networks logos for purely decorative purposes in any marketing collateral, packaging, or web site without the express written permission of Cumulus Networks. 5 Trademark + Usage Guidelines N T Prohibited Uses of Cumulus Networks Trademarks trademarks as the name of your company, products, or services, or as a domain name. You may not use or register in any jurisdiction, whether foreign or domestic, any Cumulus Networks Trademark as all or part of your company, product, or service name in a manner that is likely to create confusion as to Cumulus Networks sponsorship, affiliation or endorsement of your company, product, or service, or that may dilute the Cumulus Networks Trademark. Similarly, you may not use or register in any jurisdiction, whether foreign or domestic, a domain name that incorporates any Cumulus Networks Trademark in bad faith or in a manner that is likely to create confusion as to Cumulus Networks sponsorship, affiliation or endorsement of your company, product, or service. logos without permission. You may not use any Cumulus Networks logo unless you have an agreement with or express written consent from Cumulus Networks authorizing such use. trademarks in false or misleading advertising. Advertising for Cumulus Networks or its products or services offered under the Cumulus Networks Trademarks must not be false or misleading in any way and must not be in violation of any applicable law, municipal ordinance, or administrative agency regulation of any country. trademarks in objectionable material. You may not use Cumulus Networks Trademarks on or in connection with any defamatory, scandalous, pornographic, or other objectionable materials of any sort, including without limitation materials that may be illegal under local laws of any jurisdiction. trademarks to disparage Cumulus Networks. You may not use Cumulus Networks Trademarks to disparage Cumulus Networks, its products or services, or in a manner that, in Cumulus Networks s reasonable judgment, may diminish or otherwise damage the reputation of Cumulus Networks or the goodwill in the Cumulus Networks Trademarks. N T Misuse of Cumulus Networks Trademarks All uses of Cumulus Networks Trademarks are subject to Cumulus Networks quality assessment and approval. If Cumulus Networks, in its sole discretion, determines that any of your uses of the Cumulus Networks Trademarks do not meet the appropriate quality standards that Cumulus Networks applies to its products and services, Cumulus Networks may revoke your right to use the Cumulus Networks Trademarks. If you learn of any uses of any trademarks that are confusingly similar to the Cumulus Networks Trademarks, please notify Cumulus Networks by sending an to Similarly, if you become aware of any use of a Cumulus Networks Trademark that violates any of the rules described above, including failure to identify Cumulus Networks Trademarks as belonging to Cumulus Networks, Inc., please notify us at com. If possible, please provide a copy of the article or other medium in which the trademark violation appeared. You acknowledge and agree that Cumulus Networks owns the Marks. You will not contest or aid in contesting the validity or ownership of any of the Cumulus Marks or take any action in derogation of Cumulus Networks rights therein, including without limitation applying to register any trademark, trade name, service mark or other designation anywhere in the world that is identical or similar to any of the Marks. Achieving the goal of an enduring brand requires a conscious, coordinated, and consistent effort from all of us. Node.js Foundation Trademark Guidelines for the Node.js Marks. Q: Can I use the Node.js marks? A: Yes, in accordance with these guidelines. L. L. Bean #WinaNewPack Facebook, Instagram and Twitter Photo and Video Contest 2015 Official Rules NO PURCHASE NECESSARY. A PURCHASE OR PAYMENT OF ANY KIND WILL NOT INCREASE YOUR CHANCES OF WINNING. 1.